The fragmentation of leaves by invertebrate feeding and abrasion constitutes another important stage in leaf breakdown. Aquatic insects and crustaceans are the most common consumers of CPOM. During the decomposition of autumn-shed leaves in temperate woodland streams, microbial populations play a central role not only in decomposing the leaf substrate, but also in altering the chemical nature of the leaf material, rendering it more palatable and nutritious to consumers. In turn, the feeding activities of detritivores significantly accelerate the decomposition process. Their contribution to the fragmentation of coarse particles through feeding activities and production of feces significantly accelerates breakdown rates and influences subsequent biological processing of the original CPOM inputs. Several lines of evidence indicate that shredders accelerate the breakdown of leaves in streams (Webster and Benfield 1986). The finding that leaf packs in mesh bags decomposed more slowly than those tethered to bricks with fishing line indicated that the former method underestimated breakdown rate. 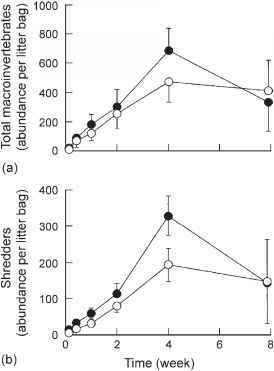 Exclusion of detritivores is a likely cause of this difference, and leaf breakdown is more rapid when bags with larger mesh size are used (e.g., Benfield et al. 1979, Wright and Covich 2005), presumably because invertebrate access is greater. Furthermore, breakdown rates are higher where invertebrates are more abundant (Graca 2001, Sponseller and Benfield 2001), and there is a positive relationship between invertebrate preferences and decay rates (Webster and Benfield 1986). 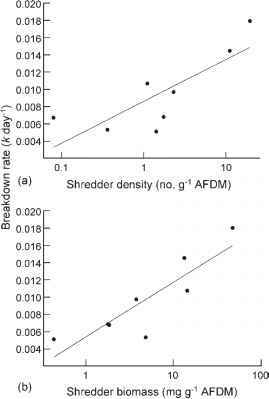 Hieber and Gessner (2002) estimated that 64% of mass loss in alder and 51% in willow leaves were due to shredders that colonized leaves early in the experiment (Figure 7.9). tropical streams, increased the concentration of both total dissolved N and dissolved organic carbon (DOC), and also the concentration and transport of POM (Crowl et al. 2001). 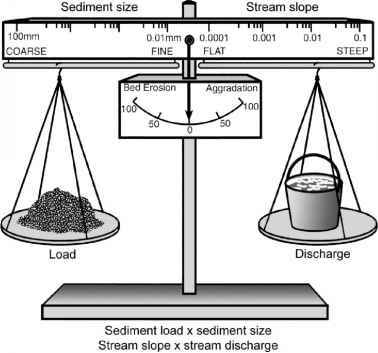 The experimental removal of detritivorous insects from a small mountain stream in North Carolina provides a particularly convincing demonstration that animal consumers regulate rates of litter decomposition. Wallace et al. (1982a, 1991) added the insecticide methoxychlor to one small stream in February, with supplemental treatments in May, August, and November. Massive downstream drift of invertebrates occurred and insect densities subsequently were reduced to <10% of numbers in an adjacent, untreated reference stream, while oligochaetes increased roughly threefold. Leaf breakdown rates were significantly slower in the treated stream, presumably due to the great reduction in insect density, and the magnitude of the effect was greatest for the most refractory leaf species (Table 7.2). Export of suspended fine particu-lates also was reduced in the treated stream, consistent with the finding of reduced leaf processing.